How to estimate the age of a cat? If you're a lucky owner of a cat, you are probably wondering whether your cat is still in his youth, or maybe is going through his midlife crisis. 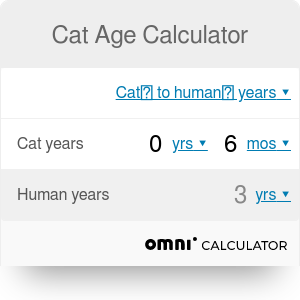 Look no further - this cat age calculator will give you all information you need, converting between cat years and human years. You are more of a dog person? Try the dog age calculator! It's a common misconception that one year in the life of a cat is equivalent to seven human years. In reality, the conversion is a bit more complicated. Kittens grow fast while they're still young, but the older they are, the slower the aging process becomes. It means that after one year, your cat is as old as a seven-year-old human child, but for older cats, each year is equivalent to only four human years. Naturally, not all cats age alike. A cat that lives outdoors will generally have a shorter life than an indoor cat. Additionally, while typical felines live about 10-15 years, certain breeds age slower or faster. Still, this cat age calculator should give you a good idea of the seniority of your cat. The easiest way to convert between cat years and human years is to use this cat age calculator. Alternatively, you can take a look at the table below that sums up the aging process of a typical feline. Cat's teeth. If you had to settle for just one indicator, this should be it. Kittens have their first permanent set of teeth when they're about four months old. If the cat's teeth are white, you could assume it's about a year old. A more yellowish color hints at the age of one to two years old, while tartar build-up or missing teeth indicate an even older cat. Cat's eyes. Young cats usually have bright, sparkling eyes. Some cloudiness might indicate that your cat is already 10 or more years old. Additionally, the iris of an older cat's eye appears to be a bit jagged. Cat's coat. The fur of a kitten is soft and fine, while older cats tend to have a coarser coat. If you find some patches of gray or white, the cat might already be senior. Cat Age Calculator can be embedded on your website to enrich the content you wrote and make it easier for your visitors to understand your message.